Need a trim, sir? Well you came to the right place! Today, we’ll be looking at another of Thunderkick’s slot machine offerings. As you might have guessed from the title, Barber Shop Uncut is set in a barbershop. 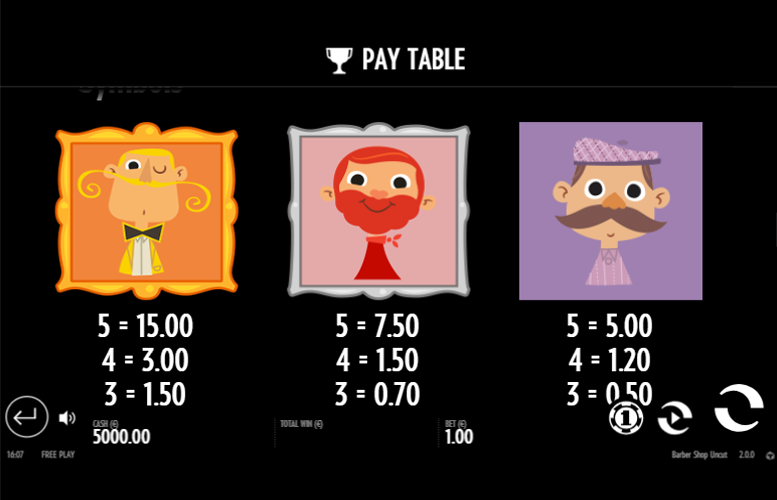 The game uses a soothing colour scheme and pleasantly illustrated symbols and its presentation is simple, yet effective. Each of the different icons appearing across the reels represents either a client of the barber or one of his grooming tools. In terms of specifics, the game is played across a standard five reel, three row board. The title’s special features are all staples of the modern online slot machine: free spins and re-spins. Let’s looker more closely at what Barber Shop Uncut has to offer players. Interesting theme. 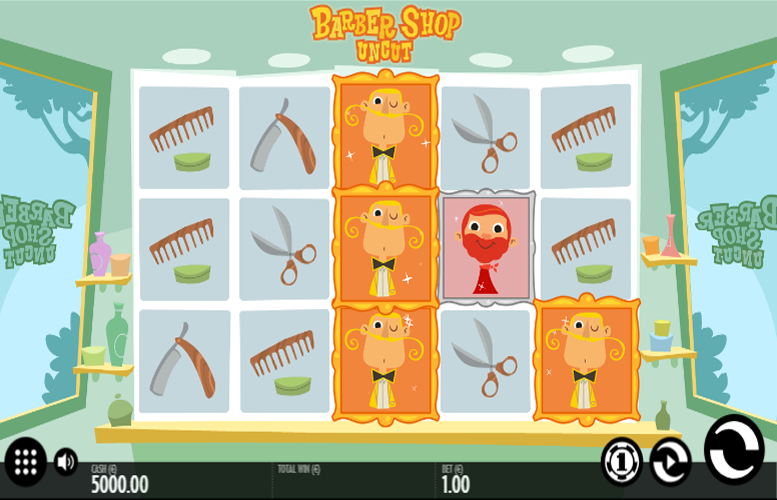 We don’t think we’ve ever encountered another slot machine title that is set in a barbershop. Simple yet pleasant artwork. The pastel colours and jovial looking moustachioed and bearded gents might be a bit of a contrast with some of the imagery used in more action-packed slot machines, but they certainly make a nice change. Decently high return-to-player rating. This makes Barber Shop Uncut ideal to grind through a large bonus. Barber Shop Uncut offers some rather miniscule main game prizes. If your idea of slot machine heaven is matching five symbols down a win line and dropping some serious cash, you will likely be unimpressed by this game. Rather uninspiring bonus features. Without a true second screen game and only a simple free spins mode and variations on a re-spin feature, fans of diverse bonus features will also struggle to enjoy this one. Yellow client = 15x the total bet. Red client = 7.5x the total bet. Purple client = 5x the total bet. Green client = 4x the total bet. Blue client = 3.5x the total bet. 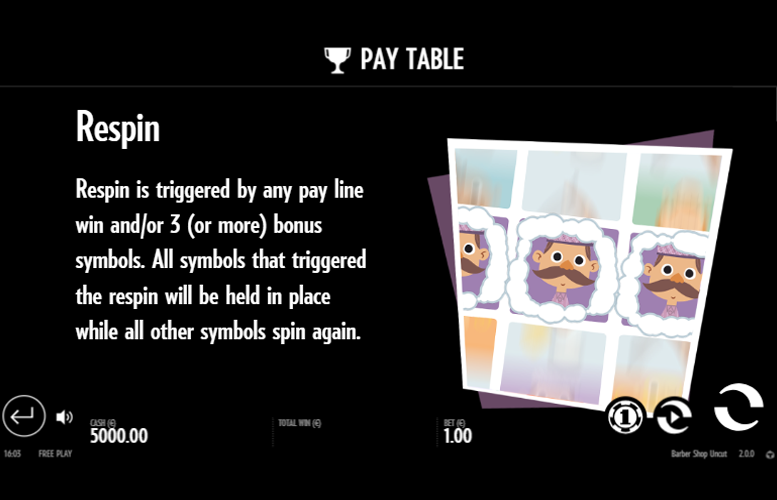 Any pay line win and/or three or more “bonus” symbols landing anywhere on the reels will trigger an automatic re-spin. As the reels spin again, the symbols that triggered the re-spin will remain in place potentially creating larger winning combinations. Landing five (or more) “bonus” symbols anywhere on the reels will award the player with 10 free spins. 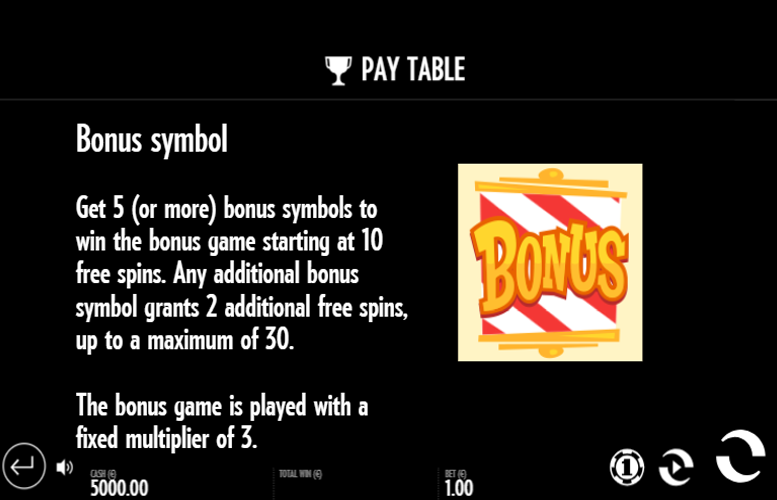 Additional “bonus” symbols will grant two additional free spins. The maximum possible number of free spins is a generous 30. What’s more, all winnings from the Free Spins mode are subject to a 3x multiplier! This can really boost your session’s profitability. 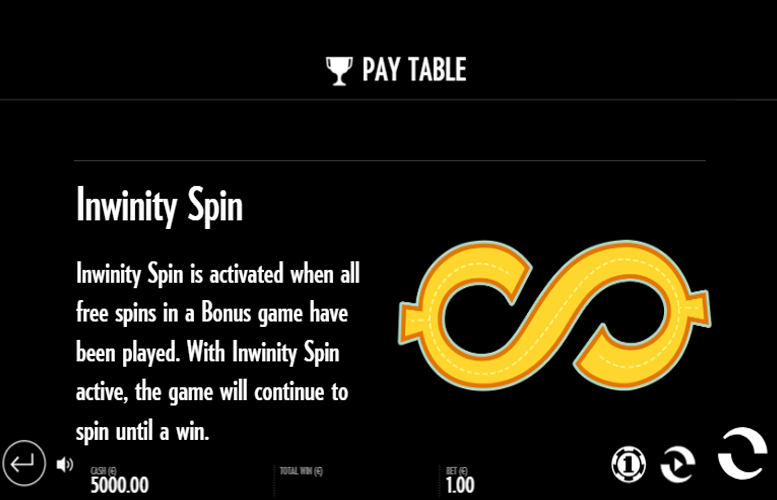 The Inwinity Spin feature is activated when all the free spins of a Bonus game have been played. When the Inwinity Spin feature is active, the reels will continue to spin until a win is eventually awarded. Razor = 2x the total bet. Scissors = 1.5x the total bet. Shaving brush = 1.2x the total bet. Comb = 1x the total bet. In terms of betting limits and distributions, players are only given the opportunity to adjust the size of the total bet. Many other slot machines let users pick how many win lines are played, as well as the amount bet on each one. Unfortunately, such controls are absent on Barber Shop Uncut. 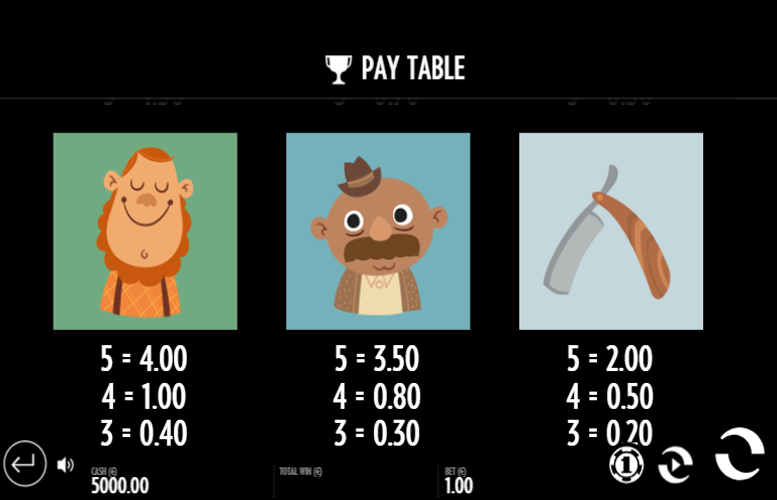 Instead, players can pick a total amount bet on each spin. Here the figures range from just 10p up to a maximum of £100. This shows that Thunderkick are seeking to appeal to all but the very highest rollers with this title. To conclude, the Barber Shop Uncut game is a bit of a let-down. Although it looks nice enough, there just isn’t enough under the bonnet to get players to keep coming back. The special features don’t offer anything new to players and are like those found on literally hundreds of different slots. The main game prizes are also miniscule. That said, if simple, well-illustrated titles with great return-to-player ratings are your kind of thing, Barber Shop Uncut might be right up your street! This game has a rating of 3 / 5 with 263 total reviews by the users.